Dual-screen laptops are better tablets than tablets, better laptops than laptops – and better desktops than desktops. Silicon Valley investor Marc Andreessen famously said: "Software is eating the world." But there's some munching going on in the hardware world as well: Screens are eating our mobile devices. Smartphone makers are racing to be first to the zero-bezel smartphone finish line. And in the laptop market, companies are scrambling to figure out how to put screens on both sides of the clamshell. The reason is obvious: While physical keyboards are superior for typing, screens are superior for every other kind of interface. By adding a second screen to a laptop, you transform what it is, how it works and what you can do with it. While today's business laptop users hate the idea of giving up physical keyboards, they'll eventually discover that it's a small price to pay for all the new goodies dual laptops deliver. If you're not convinced yet, read on. New technology emerged this week that brings the fuzzy future of dual-screen laptops into focus. If anyone had doubts about the dual-screen trend, they should have been erased this week after Taiwan's Computex event. Computex is an annual trade show focusing on PCs. Asus unveiled its Project Precog concept laptop, a Windows 10 device with two 4k screens. That's a lot of Ks for a small, thin laptop. 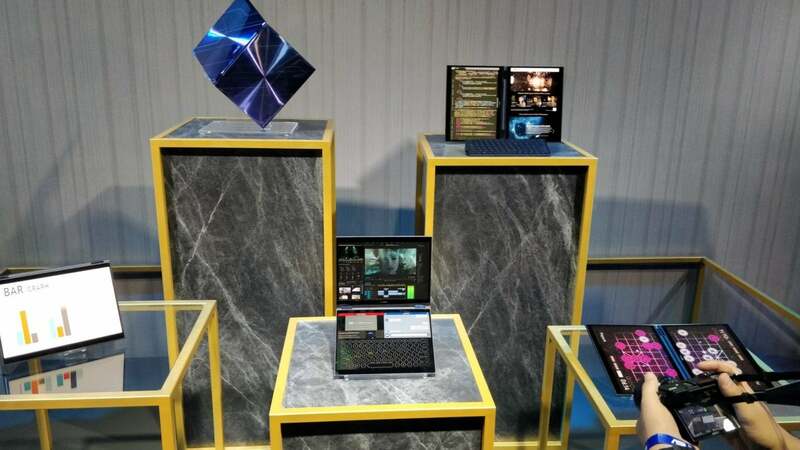 Asus's demo revealed the magic pixie dust that will make the world safe for dual-screen laptops - Artificial intelligence (A.I.). This is actually another example of how "software is eating the world." A physical hardware feature is being replaced by a screen because the screen can use A.I. software to shift between modes automatically and on-the-fly. Asus trotted out some unfamiliar phrases to describe how software makes dual-screen laptops great - A.I. changes what's on the screen based on in-the-air user hand gestures, the orientation of the laptop and the angle of the hinge. For example, in normal "laptop" mode, a keyboard appears on the lower screen only when you place your hands over it in preparation for typing, something Asus calls "Intelligent Touch." When you approach the second screen with a stylus, it goes into pen mode, which is a small part of what Asus says is "Adaptive input." And that really is the greatest benefit of a screen in place of a keyboard. While writing, the screen is a keyboard. While writing with a pen, it's a piece of digital paper. While listening to music, it's an equalizer or D.J. rig. While watching any streaming video, it's a place for subtitles, contextual information or social interaction with others who are watching the same stream. Asus says it'll ship the device next year. 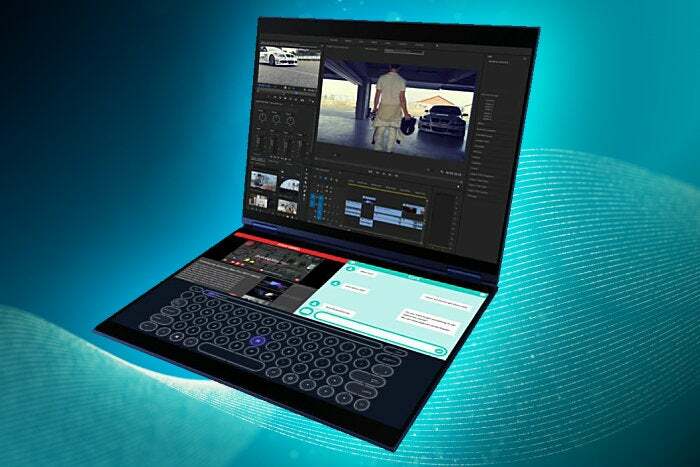 Lenovo teased at Computex a laptop that's a lot like Asus's Project Precog: the upcoming Yoga Book 2. Just like the Asus, the device will have dual touchscreens, a pen mode and A.I.-controlled screen modes. It's safe to say that these two projects define essentially the rough outline of how dual-screen laptops will work. They'll function in multiple modes depending on how they're open, oriented and being used. They'll take on-screen keyboard and pen input. They'll replace tablets. Within two years I predict there will be dozens of dual-screen laptops on the market that work a lot like Precog and Yoga Book 2. They'll use A.I. to transform the interface on the fly. More interestingly, Lenovo made it clear that dual-screen laptops are a kind of "gateway drug" to the flexible screen clamshells of the future. The company teased a Yoga Book 3, with a flexible single display covering both sides of the clamshell. When you open the clamshell out flat, you get a giant single-screen tablet with un-interrupted screen real-estate. Chip giant Intel even trotted out onto the Computex show floor a dual-display prototype laptop code-named Tiger Rapids. The clamshell sports two 7.9-in. displays. But here's the crazy part: One screen is a conventional color LCD display, and the other a monochromatic eInk, ePaper display used mainly for pen, keyboard or both together. The unit is small, thin and light, with battery life enhanced by the low-power bottom display. The Intel hinge looks a bit like a paper notebook's hinge (but also a lot like Lenovo's current Yoga Book), and enables the clamshell to open all the way for use in tablet mode, with the LDC on one side and the eInk display on the other. This demo won't become a product; it's more of a reference design and example to the industry. And it's a good idea. By using an eInk display, you can reduce the size of the device by using a smaller battery. The device reminds me of Microsoft's Courier prototype from nearly a decade ago; it was designed as a kind of interactive digital Moleskine, and which (as an idea) was way ahead of its time. You may have heard this month about a dual-screen Dell device. Facts about this project are elusive. But it appears that Dell worked on the development of a dual-screen Windows 10 mobile device code-named "Januss" powered by an unreleased Qualcomm Snapdragon 850 ARM processor. Rumors about this project popped up on the German blog Winfuture.de, based on the discovery of some older documents. Dell has not announced "Januss," and it's possible that the device will never ship. But if the rumor is true, that means Dell would join HP, Asus and Lenovo in the development of Windows 10 devices that run on ARM chips. 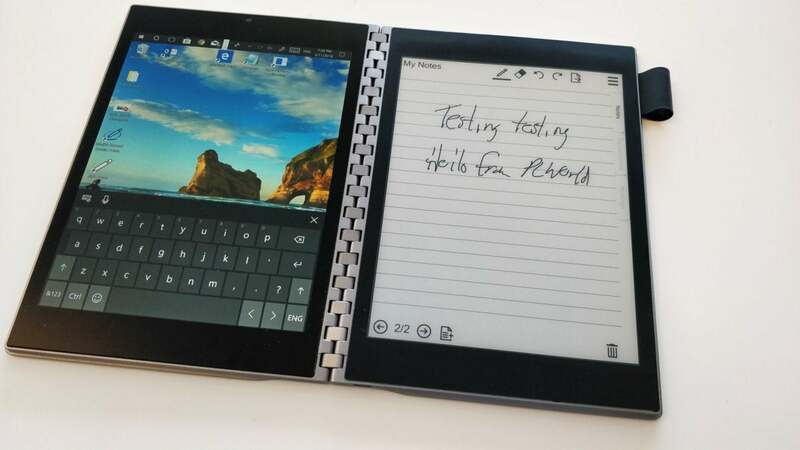 Whether Dell or Microsoft ship dual-screen ARM-based Windows 10 devices anytime soon is less interesting than that a new form factor will emerge: A tiny laptop/tablet hybrid that replaces the smartphone. I don't know about you, but I already want one. If you love your laptop, get ready to kiss it goodbye. As the emerging dual-screen laptop movement takes shape, it's becoming clear how great they'll be. Dual-screen laptops will be better tablets than tablets, better laptops than laptops and better desktops than desktops. They'll be better tablets, because they can work just like today's tablets, with twice the screen space. They'll be better laptops, because the bottom screen can be a writing pad or any number of other input devices, and not just a screen. And they'll be better desktops than desktops because, by turning the clamshell sideways and opening up the screen, then using wireless keyboard and mouse, you'll get more screen real estate than today's average desktop screen gives you. Most importantly, they'll serve as devices beyond tablets, laptops and desktops. They'll be ebooks that you actually hold like a book. In "tent" mode, they'll offer one screen each to two people facing each other at a table - perfect for one-on-one business presentations. The dual-screen laptops are coming. And they'll be twice as good as today's laptops.